Children’s vision care should begin at birth and continue throughout childhood and adolescence. Vision is learned. Without professional vision screenings, children can grow up with distorted vision that eventually causes complications during the school years. According to the American Optometric Association, undiagnosed and untreated vision problems can worsen in children because the brain learns to accommodate the distortion over time. Furthermore, untreated vision discrepancies can lead to academic, athletic and social handicaps that hold kids back from their ultimate potential. 1 in every 4 children is suffering from some kind of vision problem. Often these problems go undetected throughout their childhood, which is a critical time for the brain to develop vision. Recent studies show that as many as 11 percent of U.S. teens have vision problems that have not been diagnosed. Pediatricians and school nurses do what they can with vision screenings, but that is only a small part of vision problems. Yes. Your child’s first eye exam should occur before he or she ever leaves the hospital at birth. The nurses and neonatal doctors are immediately looking for congenital glaucoma, cataracts, or retinal abnormalities. Additional pediatric eye health screenings should occur every year from that point forward, with the first vision acuity test occurring around 3 ½. 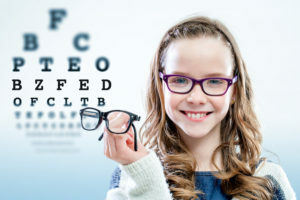 Even if your child performs well on vision screenings, it is important to have a comprehensive eye evaluation at New Optix Optometry, especially if you notice that your child is suddenly rubbing his or her eyes, squinting, getting too close to the television or tablets, or complaining of headaches. The extent of your child’s eye exams will depend on his or her age. For most kids, exams will check the eye movement and tracking, focusing capabilities, hand-eye coordination, near and distance vision abilities, color vision, peripheral vision, depth perception, and the overall health of the front and back of his or her eyes. Encourage your child to wear sunglasses, maintain a proper working distance from books, phones, computers, and tablets. Pay attention to your child’s habits with school, such as complaints of headaches after school, short attention span and fidgeting when doing homework or reading. Feed your child a nutritious diet high in antioxidants like beta carotene and lutein, as well as omega-3 fats.